Back to: Sonic the Hedgehog 2 (Nick Arcade prototype). 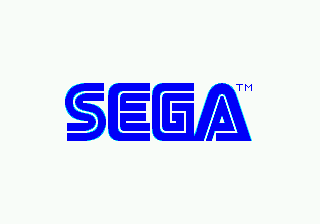 Start the game and you are introduced to the Sega logo from the original Sonic the Hedgehog, as opposed to the revised variant in the final game. All early versions of Sonic 2 use a different title screen. 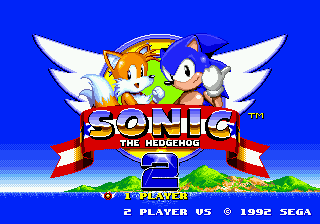 Sonic and Tails are not animated, and the background is borrowed from Emerald Hill Zone, scrolling to the left in a similar manner to the original Sonic the Hedgehog. No menu system has been implemented by this point. Aside from the logo and palette, the level select screen hasn't changed at all from Sonic 1, and is a far cry from Sonic 2. There are no title cards in this prototype for each of the zones. Instead, the game just fades from black, in a similar manner to the original Sonic the Hedgehog (which incidentally means fade in the red, then the green, then the blue, and don't touch Sonic (and Tails)). Likewise, there are no score tallies when completing a level, just a jingle. The physics are still playing by Sonic 1 rules. The land speed of Sonic and Tails is capped, meaning it is impossible to out-run the screen by normal means. The infamous "spike bug" from Sonic 1 still exists. Land on spikes twice in succession and you will die instantly. In the final game, a grace period occurs, where Sonic and Tails will flash while standing on the set of spikes. Tails is invulnerable to spikes in the Nick Arcade prototype. This is the only known build where this is the case. Sonic and Tails share a ring counter. This means, in addition to being able to pick up rings on Sonic's behalf, Tails can lose them. The AI script powering Tails is in an incomplete stage. For now, Tails behaves exactly like Sonic, just with a slight delay. It's a convincing effect for the first few seconds, but typically leads to computer-controlled Tails getting stuck or lost. Tails also cannot fly, so if he wanders too far from view, he'll be abruptly dropped in from the top of the screen. In the final game, Tails attempts to follow Sonic, and while still often unsuccessful, he's not a liability like in these early prototypes. In the case of the rolling demos, it is thought a second player was controlling Tails to ensure the results were aesthetically pleasing. The spin dash cannot be "charged" in this prototype, meaning Sonic and Tails are always released at a set velocity. If spin dashing on a falling platform, the character will remain in the air rather than fall. Run into a wall at high speed and Sonic will be thrust backwards, landing on his backside. This mechanic was removed from subsequent prototypes and has never been seen in a Sonic game since. It also only affects Sonic - Tails just stops when he hits a wall. This page was last edited on 28 April 2018, at 14:42.